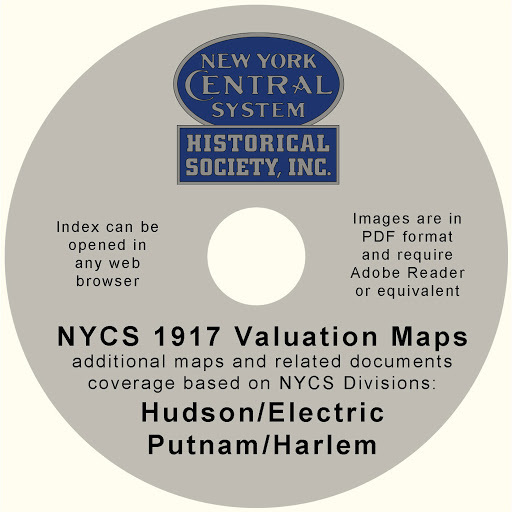 We have introduced two new DVDs: NYCS 1917 Valuation Maps of the Hudson/Electric Divisions and Information on 2013 NYCSHS Convention Area. This DVD contains 100’s of pdf images of maps and related documents along the Hudson/Electric/Putman/Harlem divisions of the New York Central Railroad. The valuation maps were created in 1917 by the NYC railroad to comply with the Valuation Act of 1913. They were used by the Interstate Commerce Commission to evaluate railroad property as the basis for fixing rates that would yield a reasonable profit to the railroads. The original maps were 24” x 56” and cover 1 or 2 miles of right of way at a scale of 1” = 100’ or 200’. Although not complete, additional right of way and land maps for these divisions in the NYCSHS collection are included. To aid in understanding this section of the railroad in the early 20th Century, line profiles and 15′ USGS Topographic maps from roughly the same time period are also included. They provide an excellent tool for modelers and historians in understanding the details of the railroad in any particular area covered. This DVD contains the valuation maps for these divisions and they are accompanied by related maps, profiles and documents to enhance the value of the information to historians and modelers. (This is the first in the series of this to be issued by the Society.) This DVD is a must for anyone interested in these divisions of the NYCS. And you might also be interested in this informative DVD providing maps, photos and related information for the areas where the 2013 NYCSHS Convention was held. 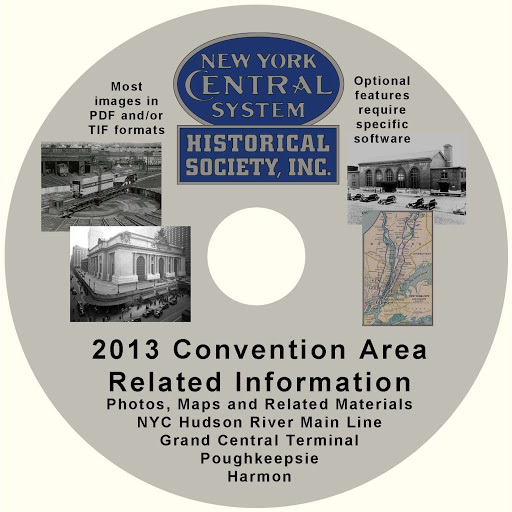 This DVD contains information on the locations that are in the area of the 2013 NYCSHS Convention. Maps – maps of the NYC Hudson River lines from various sources and time periods. Includes selected United States Geological Survey historic Topographic Maps. Additional maps can be downloaded for free from the USGS website. Photos – selected NYC photos for locations on the 2013 Convention tours in tiff and pdf formats. Publicity – Hudson River main line section of an 1896 NYC&HR publicity booklet “Health & Pleasure” describing tourist activities along the New York Central and Hudson River R.R. Track Charts – Sidetrack chart of the NYC Hudson Division mainline in 1967. Valuation Maps – original 1917 valuation maps of Grand Central Terminal, Harmon Shops and Poughkeepsie. Revised valuation maps for selected locations on the Hudson Main Line from government sources. This is a DVD that is an excellent source of information for historians and modelers in any scale who are interested in these areas of the NYCS. These DVDs will be prepared for all future conventions, providing the historian and modeler with detailed information about locations in the area of the convention. The next version is planned for the 2014 NYCSHS Convention in Cleveland, OH and will include information for the areas around Cleveland related to the NYCS. This entry was posted in NYCSHS "Collinwood Shop" Your NYCSHS Hobby Store, Research Information. Bookmark the permalink.